As we are engaged in many roll jobs, we want to shorten the work process by use of UV. We outsource jobs requiring white ink, which we want to perform in-house. Introduction of UCJV300 increased our productivity substantially. We succeeded not only in shifting jobs using white ink to in-house production, but also in enhancing the quality. We gained the capability to perform printing on colored materials and transparent materials with high density and high quality. New competitive tool recognized by decoration professional: Realize high quality by using "UCJV300" for jobs requiring white ink and solid light shielding property. It can cut short the work processes. We can shift jobs using white ink to in-house production, which eliminates the stress from outsourcing. It has a great versatility in print media. 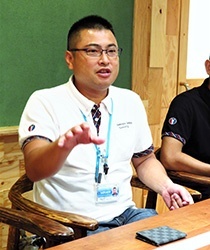 Mr. Masamichi Nomura, Chief leader of the Production and Integration Department, who was in charge of selecting the device, explains; "After deep consideration, we categorized our production items, and made a decision based on the frequency. Our most frequent orders are print on sheet roll media. We chose "UCJV300-160" because we considered shifting from solvent IJP to UV should be prioritized in order to shorten the work process." As its ink is flexible, it is not cracked or peeled on the media, which decreased cases where the printed item turns out to have a problem at the applying site. The printer is capable of printing 10.6m2 per hour, depending on the type of printed item, and it requires no drying time unlike a solvent printer. Such features improved the productivity significantly. Meanwhile, its quality is highly valued as Mr. Toga mentions "It produces the best finish quality compared with other printers in operation." 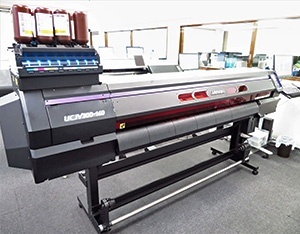 UV ink increased the flexibility for various media in printing. Additionally, as white ink is mounted, they no longer need to mind the base color of the media used for the print. As mentioned previously, the company used to outsource jobs requiring white ink. However, there was a difficulty in giving instructions, especially on how to place the white ink for two layers. In terms of expression, they are often expected to produce sensitive expressions such as "icy coldness of beer" and "sizzling feeling of food", which made it too difficult in handling to outsource. In fact, in cases requiring difficult expression, Mr. Tomari used to visit the outsourced company to make adjustments there by printing several types of samples before producing the final print. By introducing "UCJV300-160," such works can now be performed in-house, which allows operators to give modifications to realize delicate expressions, and led to higher quality. We now have less stress in struggling between little time and high quality expected. says Mr. Nomura, the Chief leader. Increased number of items printed with UCJV300-160 are utilized for cases like stage decoration for concerts where high quality is expected. Almost half of the jobs are cases where the media itself is colored or metallic, or transparent materials are used for glass decoration. First, we assign jobs requiring white ink and solid light shielding property to the UV printer. 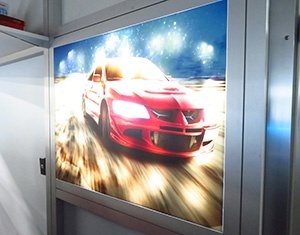 Mr. Tomari explains, "For production of transilluminated signs, we can rely on UV since ink bleed is not generated and colors come out clean with it. If we do intend to produce appearance with bleed taste, we make adjustments with solvent." The company's association with Mimaki products started by introducing "JV4". Then "JV5" was introduced later. They currently have "UJV500-160", "UJF-6042MkII", and other printers in operation. They are also equipped with 2 roll-type solvent printers. UCJV300 to serve as "New competitive tool"
"When a client says they want a wood-grain table, we consider various factors including where, how long, and how it is going to be used, how the client is particular about the finish, as well as the budget. Then we consider how we produce it based on such factors, choosing methods from our wide variety of options such as wood, wood texture sheet, paintwork, etc. Among such options, we now have a new competitive tool called "UCJV300-160"." Having introduced this new competitive tool, Shimizu Octo expects its further utilization in decorations and displays, and hopes to keep on providing the world with new value-added printed production while sharing information with Mimaki Engineering. Succeeded in shifting jobs using white ink to in-house production, which enhanced the quality to realize even delicate expressions. Gained the capability to perform printing on colored materials and transparent materials with high density and high quality. Founded in 1932, Shimizu Octo, Inc., is a company with a history of 80 years. 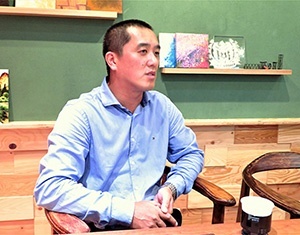 In its growing process, it established "Decoration Division" which conducts decoration works for concerts and exhibitions, which is now one of the pillars of its business. 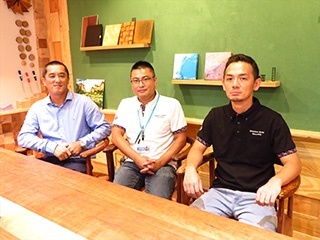 The Decoration Division was established in Shimizu Sports Decoration Center. In 1971, the division became Shimzu Butai Kogei. 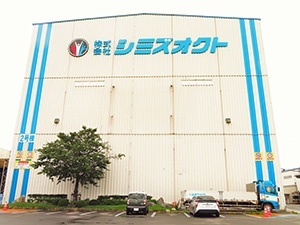 Then in 2001, Shimizu Sports and Shimizu Butai Kogei were integrated into Shimizu Oct, Inc., which has operated as a single company up to the present day. The company has a top-class successful track record of sports-related decoration in Japan, and provides behind-the-scenes support for concerts of world’s leading artists, international sporting events, as well as booth decorations for large-scale exhibitions. 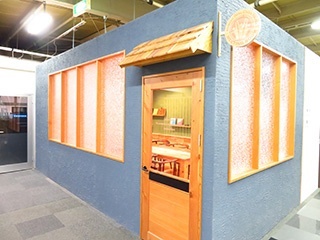 Its base in Tokyo metropolitan district is Shimizu Octo Chiba Studio, located in Sodegaura city, Chiba prefecture. The studio was opened in 1990. Opening of Tokyo Bay Aqua Line in 1997 allowed them to provide further quick response and operation availability of the studio. The company handles not only printing, but also woodworking, sculptural work, paintwork, metal working, stage machinery, and large stage system, and is equipped with facilities capable of conducting transportation, site installation, and waste processing, all in-house. This is why Shimizu Octo has a significant competitive advantage in providing comprehensive services related to events. One of the unique characteristics of its business is that the clients entrust it with the materials and methods of coloring, which allows it to decide details at its discretion, and to realize the ideal form using easy-to-create methods by comparing the quality and cost. IndustryVenue preparation, visitor service, security service, facility service, imaging technology, international business, etc.